In ‘Votives on display (Part 1)’ I wrote quite generally about how votives might have been displayed in ancient sacred spaces. In this second part I want to try out some ideas about how particular types of ancient Italian anatomical votives might have been displayed and suggest that thinking about this might offer some new angles from which to contemplate their meaning(s). I’ve picked three examples that interest or intrigue me, rather than ones that are necessarily representative, and some of my suggestions probably raise more questions than they provide answers, but I thought this would be a good place to do some ‘blue sky thinking’. 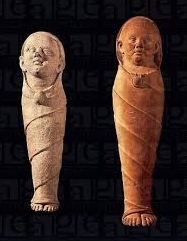 Swaddled infants from Vulci, Porta Nord. Neither of these examples can actually stand upright without support, despite the impression given by here. Beginning with swaddled infants – since these are the type of offering that I have worked most closely with and which stimulated these thoughts in the first place – it is clear that most terracotta models of newborn babies could never have stood upright unaided. They are either too top heavy – the thick clay pressed into the moulds for the face, and sometimes the back of the head, makes their heads rather solid and dense – or their tiny feet are rarely flat or broad/long enough to support the weight of the entire model with its heavy head. Evidently, then, they were not designed as freestanding statuettes, like other types of large and small figurine. This is probably fairly unsurprising given that infants of such a young age cannot stand up anyway. Terracotta swaddled infant from Falerii, with a flat unadorned back (trust me!). The back of most infant votives (but of course not all – some are moulded with swaddling bands to match the front, and one example I looked at even had tiny buttocks!) comprises a fairly flat surface which suggests that they were probably intended to be laid down, like babies in a cradle or perhaps, as some reconstructions suggest, propped up so that they were leant against a wall, cult statue or altar. This might initially seem a bit odd given that many of us would probably never dream of propping a very young baby up against something – in the UK at least we are more accustomed to leaving tiny babies lying on their back (or their tummy). But other swaddling cultures, especially those which produce quite rigid forms of swaddling using backboards or cradleboards, might find this a more logical thing to do, especially if parents are accustomed to carrying an infant in an upright manner, rather than cradled in the arms. So perhaps it should not be ruled out. 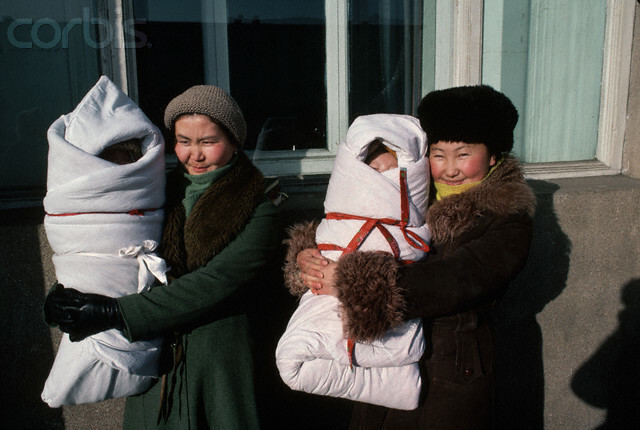 Two mothers carrying their thickly swaddled infants in an upright position (Mongolia). 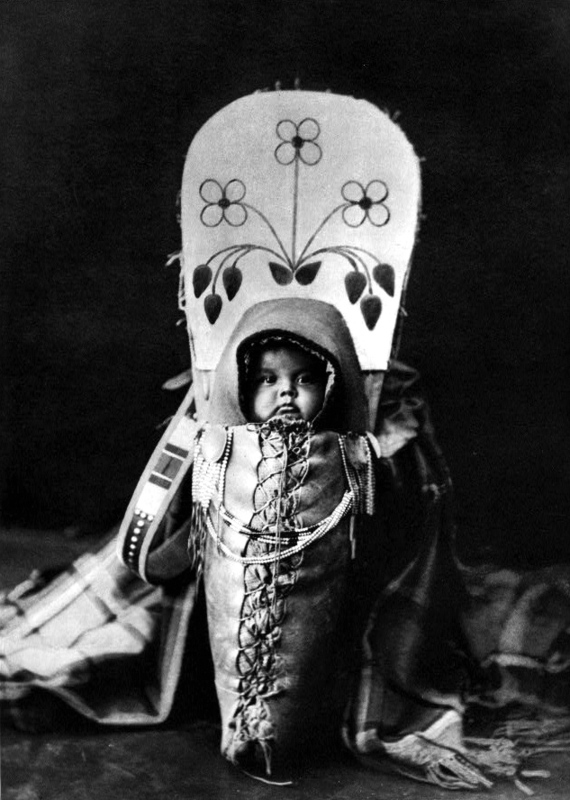 Early twentieth century infant swaddled using a cradle board, Nez Perce tribe (North America). Similarly, many infant models have an air hole in the back, to stop the model from exploding in the kiln. It is not impossible that these were used to suspend the offering. Perhaps they were hung from knotted cords or leather thongs, or even balanced on nails driven into the wall. Again, this is not an entirely anachronistic way of treating swaddled infants in some cultures which are known, for instance, to hang swaddled infants from trees whilst their mothers are working in order to keep them safe from predators. What about their arrangement in relation to one another? Were they clustered together? Sometimes infant ex-votos are found in substantial numbers (48 at Vulci, Porta Nord) although never in the same quantities as other types of offering which can number in the hundreds or thousands. Nevertheless, even a relatively small array of little bodies clustered together might form a powerful visual representation of the future of the community. I was talking recently to a non-archaeologist friend who reminded me of Antony Gormley’s Field (1989–2003). She recalled how discomforting it was to see this collection of small, clay figures with very basic features clustered together, all looking out at her, unmoving. They each had character and seemed to represent an individual, but collectively stood for a much bigger community. As Gormley says for his own installation, ‘I wanted the art to look back at us, its makers (and later viewers), as if we were responsible – responsible for the world that it and we were in.’ Votive infants don’t appear in such numbers, and were perhaps not arranged as densely as this, but when clustered together with other votives, including adult heads, they might have a similar effect, visually recalling the composition of the local community and its different members, both young and old. All assuming, of course, that these ancient objects were placed to look out at the person entering the sacred space, and not turned to look directly at the cult statue. 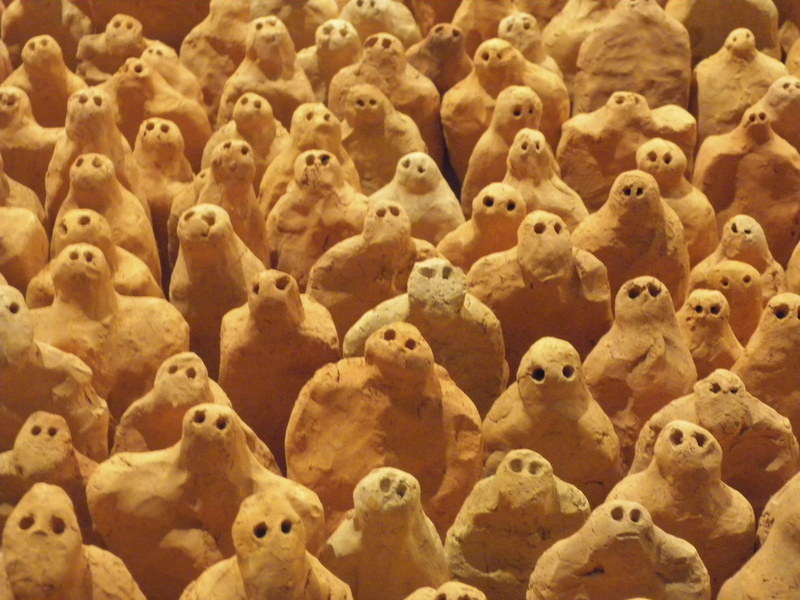 Close up of some of the individual yet collective figures in Antony Gormley’s ‘Field’ installation (1989-2003). 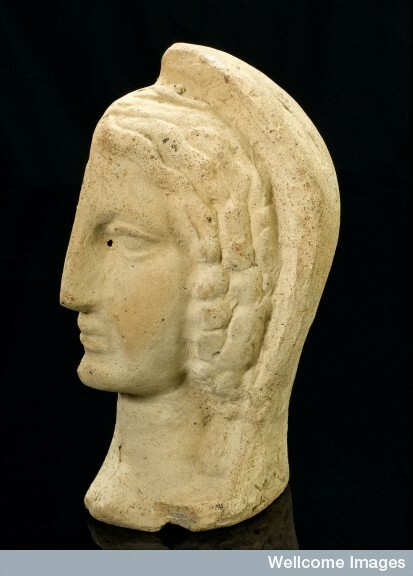 Speaking of heads, the half-heads of Italy are often thought of as slightly strange things. Sometimes they are assumed to be connected with headaches or migraines, representing localised pain in one part of the head as well as a feeling of incompleteness associated with cluster headaches which strike behind one eye. They might also, however, be connected with a fragmented sense of self, with the head representing the seat of personal identity. Perhaps we might also detect meaning in how they were displayed. Again, these objects can, but do not stand upright very easily. 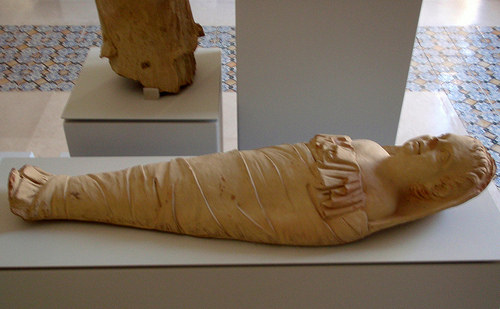 In museum displays they are commonly exhibited lying down – like a person lying on their side – or propped against a support. But there are other possibilities. Like the infants, vent holes in the back (in this case the missing side of the face) might have been used to hang half-heads from a nail so that they were pressed directly up against the wall, as if listening against a door. This would have created a striking impression. Imagine walking into a gloomy space, lit only by flickering oil lamps and a few rays of sunlight coming through the door, to see heads emerging from or disappearing into the walls around you! Nonetheless, such an arrangement may have made them – and by extension the person who they represented, or more accurately, embodied – appear quite literally embedded within the fabric of the god’s sacred space. These might be thought of as people emerging from, or sinking into, the world of the divine as part of the process of seeking godly assistance and surrendering their bodies to a deity. 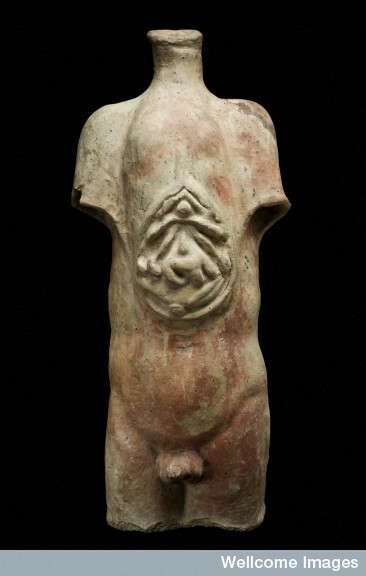 Terracotta model of a male torso, cut open to reveal the internal organs of the abdomen. Possibly from Isola Farnese, near Rome. Finally, amongst the most distinctive but still poorly understood of all anatomical votives are the models of open torsos. These are often substantial pieces, almost like a second cult statue in terms of their size and the way in which they might come to dominate a space and attract the eye. Here was the interior of the human body exposed to the sight of the divine as well as members of the religious community. These must have been expensive items, not just because of their size and complexity, but because of the skill and the knowledge needed to produce them (even if they are not always entirely anatomically correct). As a result, we might speculate that open torso statues perhaps remained in the sacred space longer than other less prestigious items which were cleared away more rapidly. Maybe other offerings even came to be clustered around these models in the same way that they did the cult statue itself, serving as an additional focal point for the performance of religious activities. They testified to a considerable religious but also economic investment in the god and his/her powers to intervene in the body. I also find it hard to imagine that amongst close-knit local communities people wouldn’t know who had made such an elaborate offering. So perhaps they also attested or contributed to the social standing of the dedicant within the local religious or socio-political community, displaying not only the interior of their body but also their close personal connection to the divine. All of this is speculation of course; we just don’t know. But by thinking about these objects in the context of their dedication, and considering some of the possibilities for display, we can perhaps find new ways of asking questions about their role in shaping ancient concepts of votive cult. Here I’ve suggested that their arrangement might be connected with a range of different ideas, including real activities associated with infant care, the physical bodily connection between divine and mortal, and broader negotiations for economic and social position. When added together – remembering that each votive might itself be a multivalent object for the dedicants themselves – this multitude of meanings may have created an object-filled sacred space which could be ‘read’ in highly complex ways, just as Anthony Gormley’s Field conveys different meanings for different people. A room full of body parts, belonging to the community who worshipped at that place but broken down into their constituent parts and reassembled as a sort of composite body with multiple heads, limbs and wombs, combined with the bodies of future adults, must have been a powerful and deeply thought-provoking sight, evoking that community’s past, present and future.